We eat them rolled. We eat them stacked. They’re filled with stuff and that’s a fact. No, that isn’t Dr. Seuss talking. That’s just me describing one of our very favorite Southwestern treasures, the enchilada. In 1949, a magazine called American Food and Drink described enchiladas as a Mexican dish prepared more for tourists than for locals. Sorry folks, that was then and this is now. 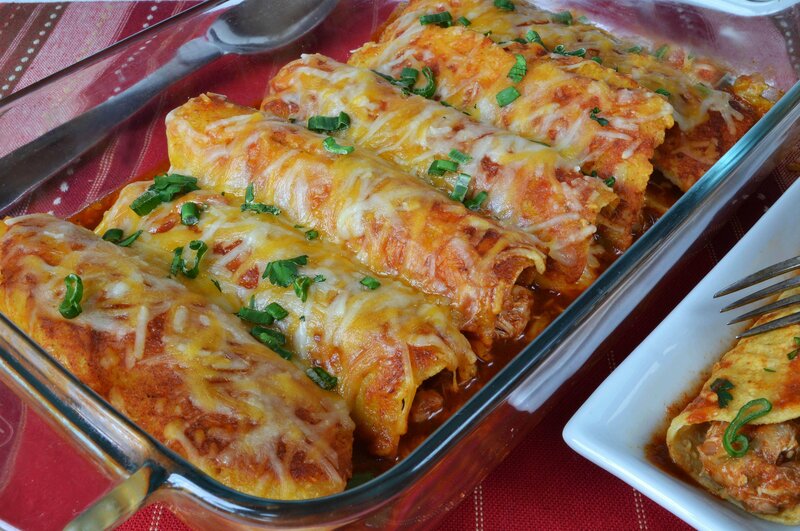 Today, enchiladas are enjoyed both north and south of the border, and in many different ways. They’re often filled with pork, chicken, beef, cheese, shrimp, crab, or even vegetables. The traditional sauces are made with either a spicy red chile sauce, a tomatillo sauce, or the Tex-Mex brown gravy chili sauce combination. Then just garnish for greatness! If you want to take your enchilada casserole to the next yummy level, give these homemade corn tortillas a try! In a large sauté pan, heat olive oil. Sauté onion and garlic until soft and golden brown. Add green chilies, shredded chicken, cumin, and garlic. Stir to combine. Add crushed tomatoes and ¼ cup enchilada sauce. Cook on medium heat for 15 minutes. Add salt and pepper to taste. Set aside and make tortillas. In a bowl, whisk together corn meal, flour, egg, water, and salt (batter should be consistency of thin pancake batter - add more water if needed). Heat in a small cast iron skillet or crepe pan coated with oil to medium high heat. With a ladle or measuring cup, pour a thin layer of batter in pan to make a 6" tortilla. When tortilla forms bubbles, flip and cook for about 30 seconds. Put on a plate and cover with a towel to keep warm. Repeat until batter is used up. Heat the enchilada sauce to warm. In a 9" x 13" baking pan, pour about ½ cup of warm enchilada sauce on bottom of pan. Dip each corn tortilla into warm enchilada sauce to coat on both sides. Place approximately 2 heaping tablespoons of enchilada filling on tortilla and roll up. Place enchilada seam-side down in pan. Repeat until pan is full. Pour remaining enchilada sauce over the rolled up tortillas. Sprinkle with cheese. Bake at 350ºF for about 15 minutes. When done, top with chopped tomatoes, cilantro, green onions, and dollops of sour cream.